So make sure to visit Celeb Dirty Laundry for our Celebrity Big Brother US recap between 8 PM and 9 PM ET. While you wait for our recap make sure to check out all our CBBUS recaps, videos, news, spoilers & more, right here! Its day 13 inside the Big Brother house and we are about to see the second eviction in days. Kato nominated Dina and Tamar, but his real plan is to evict Ryan. Dina is shocked but excited to play the Veto. Tamar says that Keto made a huge mistake, she has never seen anyone come after a good honest woman. Tamar confronts Kato about his saying that she doesn’t clean up. The two get into an argument, Kato tries to say that he was not trying to be negative. Joey tells Kato not to take the bait. Next, Kato tries to calm Dina down and tell her that she is not the target. Tamar is still upset, she is crying to Lolo and Natalie. They try to motivate her and get out of her funk. Planning a back door is one thing, keeping it a secret is another. Tamar approaches Kato and tells her that she was hurt by what he said, it felt personal. Kato is glad that Tamar talked to him because she is not his real target. They hug it out and both seem happy. Tom has an idea, to team up with Natalie and Lolo, with Kato that would be an alliance of four. Kato has this brilliant plan to tell his alliance of four, that he plans to back door, Ryan. The women think it is a great idea and both are on board. Ryan peeks into the outdoors, it appears that he overheard them talking, and he did. Ryan goes to Joey and tells him Kato plans to back door him. Ryan and Joey decide to ask Kato right out, do they need to pack up. Kato admits there is a chance, it could happen. The goal for Joey and Ryan are to win the POV. Ryan knows if he doesn’t get picked to play the Veto competition, there is no doubt that he is going to be backdoored. It is time for the POV competition and this one is called World Wide Rollout. Each houseguest is about to launch their own movie. One at a time, they will roll their ball around a large flat globe in the attempt to get their ball in the highest number slot. The slots are numbered 1 million to 100 million. The houseguest with the highest score will win the POV. The order to roll was determined by random draw, Tom is first. 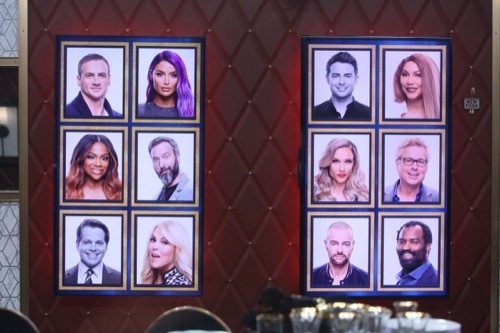 Tom got 35, Dina gets a 0, Kato gets 15, Natalie Eva Marie gets 0, Tamar gets 35, Joey gets 25. Its a tie between Tamar and Tom, they go to a shootout, Tom is first. The person with the highest score will win the POV. Tom gets a 70, Tamar gets 45. Tom wins the POV. Tom only gets a few minutes to decide. In the end, Tom uses the POV to take Dina off the block. Kato now has to name a replacement nominee, he names Ryan. Tamar and Ryan take a few minutes each to say their final words. Time for the live voting to begin. Joey is first and he votes to evict Tamar, Tom votes for Ryan, Lolo votes for Ryan, Kandi votes for Ryan, Ricky votes for Ryan, Natalie votes for Ryan. Its official, all of the votes are in, with a vote of 6 to 1, Ryan is evicted from the Big Brother house. Ryan talks to Julie, he says it was just gameplay and knows he was targeted because he is a strong player. He says he should have gone with his gut. Julie asks if it will be awkward with Lolo at Olympic Village, he says no, this is simply a game. Ryan says that training is easy than being in the Big Brother house. But he walked in with no friends, and now has 11, it is going to be fun.